The ever-changing, cracking pace of life with a toddler can make getting out of the house seem like a real challenge. But with a bit of organisation and the right helpful products, your kiddo will not only be sorted and well-fed, leaving the house will actually be fun for you too! Perhaps that has you thinking that you need to pack a giant kid-kit with military precision? We promise that’s not the case. A small-yet-effective packing list and a positive attitude will get you ready for a great day. Here’s how to totally win at the going-out game! Plentiful and varied snacks will keep your toddler healthily entertained and keep their appetite at bay. Grapes, cherry tomatoes, crackers, sandwiches, blueberries, strawberries, banana, steamed vegetables, raw vegetables and sultanas are all great choices. Pack more than you need, factoring in regular meal times and extra snacks – because life does not always run to plan! Be prepared and reduce messy accidents with spill-free cups and snack containers. We love Munchkin Miracle Cups, Munchkin Snack Catchers and Munchkin Love A Bowls for drama-free days out. Don’t forget to pack plenty of baby wipes, extra nappies and a change of clothes to keep all your bases covered (and your toddler happy!). If you’re out and about, safely storing a dairy snack can be a bit of a challenge. A toddler drink like Munchkin Grass Fed, made from the milk of 100 per cent grass-fed cows, can provide an easy to transport, nutritious dairy snack for toddlers on the run. Just add boiling water and you’ll soon have your hungry child sorted and smiling, ready to face the day’s adventures. While snacks are heaps of fun, it’s a great idea to pack some other bits and bobs to keep your child amused while you’re on the go. Two or three of their favourite toys or books are a great place to start – but make sure they are a manageable, transportable size. 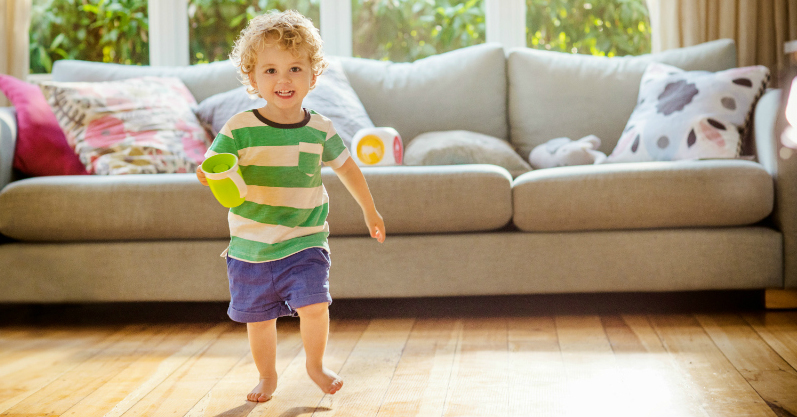 A “less is more” approach also makes belongings easier to keep track of because, as we know, toddlers are prone to flinging things from their strollers to keep themselves entertained! While spending the whole day out may seem like a fun idea, it can be an exhausting prospect for your little one. Plan your day around your toddler’s nap times and keep an eye out for cues that their enthusiasm’s flagging. Outings in toddler-sized doses may be a little less relaxed than you might like, but they’re much better than coping with an over-tired and tantrummy toddler when you’ve over-stretched them. A little bit of forward planning goes a long way to ensuring fun outings with a toddler in tow. A can-do attitude and some clever toddler products make things even more stress-free. We wish you the very best parent and child outings! May they be full of smiles and tantrum-free!